Black smoke marks where clashes are taking place between pro-government forces and an alliance of anti-Moammar Gadhafi rebels who have joined forces with the Islamist group Ansar al-Sharia in Benghazi, Libya, Aug. 15, 2015. Libya and the Sinai are “vulnerable” areas that the Islamic State group would like to exploit for potential oil revenue and recruits, officials say, as oil production and moving fighters have become more difficult in Syria and Iraq. 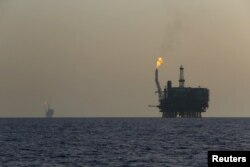 “They are looking at the oil assets in Libya and elsewhere, but we’ll be prepared,” a senior U.S. official told reporters. The official said the U.S. is taking a “very hard look” at what’s going on at every part of the oil pipeline system in Libya, Sinai and elsewhere, from the wells to the trucking routes. Oil production in Libya has fallen from 1.5 million barrels of oil per day at the beginning of the Moammar Gadhafi-era civil war in 2011 to less than 400,000 barrels of oil per day today. FILE - Offshore oil platforms are seen at the Bouri Oil Field off the coast of Libya, Aug. 3, 2015. ​That, compounded with falling oil prices, has led the U.S. to watch the area closely for domestic IS recruits. “There are more oil and gas employees who are out of work, so they are easier targets to recruit,” the senior U.S. official said. Foreign Islamic State recruits are also a growing problem for Libya, a defense official told VOA Tuesday on the condition of anonymity. He explained the terror group is having an extremely difficult time getting people into Syria and Iraq, so IS recruits are being directed to Libya instead. “Libya is the next big thing for ISIL,” the defense official said, using an acronym for the group. When asked if the U.S. might target Islamic State oil revenues in Libya as it has done in Iraq and Syria, a Pentagon spokeswoman, Michelle Baldanza, told VOA, "it wouldn't be appropriate to comment on any potential planned or unplanned future operations." Iraqi Security Forces and Kurdish peshmerga in Iraq’s north have ripped away oil revenue from Islamic State as they retake territory from the terror group. “They no longer control oil fields in Iraq, and the ones that are contested oil areas are not producing,” the senior U.S. official told reporters. 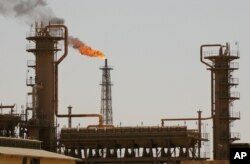 FILE - Iraq's largest oil refinery in the northern town of Baiji, Iraq. Baiji oil refinery, Iraq’s largest, was taken from the Islamic State group in October. President Barack Obama said earlier this week the terror group has lost 40 percent of the populated areas they once controlled in Iraq. In Syria, Islamic State militants control roughly 80 percent of the oil fields, but oil production, the group’s primary source of revenue, is “going down by the day,” according to the senior U.S. official. The revenue is down for three reasons, he explains. First, the volume of IS-controlled oil being sold has dropped due to coalition strikes damaging production infrastructure and destroying the trucks used to transport illegal crude. Second, recent coalition strikes have forced IS to replace expensive refinery parts and pay more money to the few drivers still willing to drive oil tankers, cutting into the group’s profits per barrel. Third, the market price of oil has dipped by about half since June 2014. Recent estimates of IS production at $40 - $48 million per month are no longer accurate, according to the official. “I believe it’s lower than that,” he said, without giving any new numbers, pending further assessment of the effects of Tidal Wave II, a coalition operation that targets oil trucks and infrastructure across Syria’s oil-rich Deir el-Zour region. He said it is much easier for tankers to resell oil nearby than risk moving it across the border to Turkey. Carla is VOA's Pentagon correspondent covering defense and international security issues. Her datelines include Ukraine, Turkey, Pakistan, Afghanistan, Iraq and Korea.